Ok, as promised in my review of Unertl Weissbier a month or so ago, I’d get into the history of the style. Promise kept, there’s no better time to review Schneider Weisse, the flagship Bavarian weissbier from the world’s oldest weissbier brewing company, G. Schneider & Sohn. In this review, I’ll get into a bit of history, with the assistance of Diplom Braumeister Eric Warner, who wrote the definitive treatise in English on weissbier, entitled German Wheat Beer in 1992. Wheat beers actually date back to the beginning of time, when many alternative malted grains were used, wheat included. The recognizable Bavarian style evolved around the 15th century with the Degenberger royal family, who built the first known weissbier brewery (which still exists) in the town of Schwarzach, just west of Nürnberg. Here, they awarded themselves exclusive weissbier brewing privileges. These rights were later extended by Duke Wilhelm IV of Bavaria until a subsequent ruler, Duke Albrecht V demanded a tribute be paid from weissbier sales. This led to a tax dispute, which was resolved upon the death of Baron Hans Sigmund of Degenberg – who passed away heirless in 1602 – which meant the rights to his brewery and beer passed to the Bavarian houses of Dukes and the Wittlesbach empire. A clever businessman, Duke (and later King) Maximilian I – whom astute readers may recognize as my own moniker – decided to get into the brewing business by declaring that the brewing of weissbier was exclusive to the house of Dukes and banned all other competitors. He moved the operation to Munich where he constructed a weissbier brewery on the site of what is now the Hofbräuhaus and expanded the Degenberger network of breweries. The demand for weissbier increased dramatically through the 17th & 18th centuries due to this royal patronage and the lighter, spritzier character of the brew against the dark brown beers that were otherwise typical at this time and the proceeds to the royals were such that profits from weissbier sales were enough to finance a good portion of the Thirty Years War (1618-1648). As sales were slow, he struggled for some time, all the while plotting for the privatization of weissbier brewing rights – which he successfully negotiated in 1872 as part of a lease swap – ending two and a half centuries of exclusive royal privilege. The renewal of public rights resulted in a mild resurgence of the style around Bavaria, Swabia and parts of Austria for a time, although nothing like what had previously been seen under royal brewers due to the emergence of pale lagers, primarily pilsner, which by this time dominated the marketplace – and still do. The real renaissance in weissbier did not occur until well after World War II and the style’s resurgence – and “export” beyond Bavarian lands – was led by the pale blonde weissbiers of the larger breweries, such as Erdinger (now the world’s largest weissbier producer), Hacker-Pschorr, Paulaner, and Spaten’s Franziskaner, most of whom are now owned by multi-national brewing conglomerates. These are also the same folks who introduced many to a “slice of lemon” in the glass, as a way to introduce a cloudy beer to a world now typically consuming paler lagers and pilsners. By this time G. Schneider & Sohn, still family owned, had grown as well. They expanded brewing into Kelheim and Straubing in 1927 and moved their entire production to Kelheim in 1944, some 50 kilometers north of Munich. Their Weisses Brauhaus still exists as a restaurant and hall in downtown Munich, just off Marienplatz and is well worth the visit. I’m partial to late Sunday mornings over weisswürstl and a few half liters, when there is usually traditional music played. Anyway…on to the beer: Schneider Weisse is relatively well known in the U.S. as they have been exporting since the early 1990’s. Because so many people were introduced to weissbier with one of the blonde versions – or God forbid, a Widmer Hefeweizen – they often mistakenly refer to Schneider as a “Dunkelweiss,” when it is actually an “Original” weissbier. This style is rather common among the smaller, traditional weissbier breweries in Bavaria, all of which are based loosely on Schneider’s version. Most weissbier fans are familiar with some special pouring technique, in which a beer is poured into what we commonly call a “tall pilsner glass,” the 22 ounce tall glass that Applebee’s calls “Brutus.” It should be poured nearly horizontal into a wet glass, to prevent over-foaming, or upside down (takes a bit of practice and is less sanitary, but looks cooler) with the lip on the edge of the foam. Either way, one should save about an inch of beer to swirl around the bottom of the bottle, before throwing in the last foamy bit of liquid, containing the dormant, cloudy yeast and allowing the head to billow up into the top of the glass. Schneiderweisse pours deep amber or light brown in color, with a bouquet full of expected banana and clove aromas. The initial sip is sweet and full, with a rounded and soft body, containing hints of earthy fruitiness. The finish is relatively clean. The head is creamy, but with larger bubbles than some versions and it does not hold as well as it does when fresh. I find that it takes a few sips of weissbier to truly get the palate adjusted. Once you get the idea, however, it leaves the tongue asking for more. Original is a very consistent brew and holds up relatively well as an import (as opposed to many lighter weissbiers, which can become sour and tangy if incorrectly stored) and would never be a bad choice in my book. This is one of my favorite beers -often serving as my session brew of choice – and only a slight lack of complexity differentiates it relative to some of its micro-cousins. It’s simply wonderful, even here in the U.S., and it’s a little slice of heaven if you have a chance to drink it at the Weisses Brauhaus in downtown Munich. Despite the lessons learned from the kids in South Park should the Canadians ever go on strike, Canada is, in fact, another nation, which means that Unibroue counts among the list of passport bearing beverages. The Uniboue story begins in the early 1990s, when a pair of French Canadian partners took over the existing La Brasserie Massawippi, a financially troubled brewery in Lennoxville, Quebec. They partnered with a Belgian brewery and quickly established themselves in the North American craft brewing scene with the launch of their first abbey beer, Blanche de Chambley. Their reputation—and business—has grown from there and they are generally regarded among Canada’s premier craft brewers. As a now publicly held company, its products are distributed throughout Canada, the U.S. and Europe. 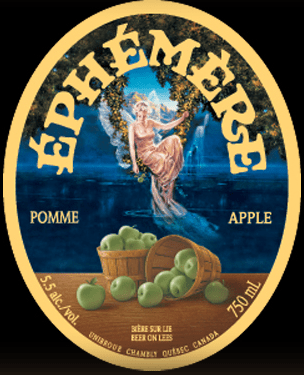 Today, I tried their Ephemere Apple, a rare venture for my German palate into the world of fruit beers. As regular readers may recall, my German brewing roots typically prohibit much tolerance for spiced or fruit beers, but I do keep trying ’em, just in case something gives. Ephemere pours blonde, as its base is a simple Belgian wit. There’s a huge Granny Smith nose, however, which leaves no doubt as to the direction this one will go. It has a slightly sour bite, off-balanced with a nice fruitiness that is (thankfully) a mere fraction of the bouquet. The body is thin and it’s highly carbonated, perhaps due to age, as the bottle conditioning may be a little “overly-done,” to quote Mel Blanc. It finishes tart, with lingering sour notes. While this wasn’t horrible—as I feared—it still wasn’t good. Despite my reluctance, I have had a few decent, and even “good” fruit beers. Unfortunately, this wasn’t one of them, although I suspect age may have been the greatest factor in its lack of balance. For a little International flavour (see? I used the “ou” spelling) here in the digital beer universe, I’m sticking with the theme as I procured a small supply of Bavik Pils, which is generally regarded as Belgium’s (and one of Europe’s) finest pilsners. While I have to consider that this style—or any lighter lager—will take a beating as an import, this is a good effort … albeit nothing more than what was to be expected. Well, I’m hoping to get back in the saddle here as I’ve been away from actually writing about beer, even though I’ve managed to keep the sampling pace going. This one is better than most, particulary as an import. One final brew is on the schedule for this month. I’ve covered quite a bit of the story of Bavarian weissbier in my reviews of Unertl and Schneider recently (you can search them above). Michael Plank has a story on his own. He’s the current owner of his family’s traditional brewery, located in Laaber, just west of Regensburg in central Bavaria. In fact, the current Michael Plank is the 16th(!) first-born male sharing the same moniker. His wife’s name is Michaela and his first born son is, of course, Michael. Currently in his late 30s, Michael took over the brewery at age 21 when his father passed away and he has completely modernized the production facilities. In fact, he’s capable of running the brewhouse operations with his Blackberry. His mother still runs the Gasthof (restaurant) next door. “You must wear your brewer boots,” he replied with a grin. Those of you who may be professional brewers will know what I mean. Plank is another of the small, family-owned traditional weissbier breweries that has finally made its way to U.S. shores from its small hometown in Bavaria. Rather than advertise, he decided to enter the World Beer Cup, a worldwide brewer competition held every other year in the U.S., with the last in Chicago in 2010. He’s now taken gold medals for his weissbiers at the past four World Beer Cups … and was awarded “Small Brewer of the Year” in 2006. He also makes a Dunkelweiss, Weisenbock Hell and Weizenbock Dunkel, which are available in the States. His flagship, however, is the Weissbier—or Hefeweizen on the U.S. label. It pours a little darker than the macro versions that many Americans are used to, as there is a hint of caramalt in the grist bill, but the additional body holds up well during import. The head is soft and fluffy and the taste is balanced, with hints of the traditional spicy banana and clove influence without being overwhelming. The mouthfeel is full, soft and slightly fruity. This is an outstanding traditional weissbier and blows away anything from the larger players such as Erdinger, Weihenstephan, Hacker-Pschorr and the like.